Gregor Hildebrandt uses audio as visual material. His work uses outmoded analogue recording technologies—the magnetic tape of cassettes, vinyl records—to create pieces that point beyond their sleek, reflective surfaces. Contemplating a work by Hildebrandt is a synaesethetic experience, as audio takes physical form. 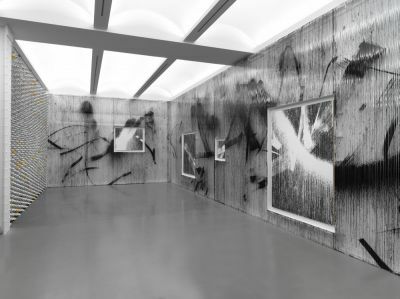 For his show at Perrotin, his 5th with the gallery, he has a created a labyrinth of panels made with various media. Hildebrandt’s interest in magnetic tape extends beyond its visual potential. His selection of the recordings contained therein is as carefully intended. The artist himself is inextricably at the center of his work; it documents his musical tastes as much as his lived experiences, given music’s associative power. A viewer’s familiarity with a recording used by Hildebrandt, something a work’s title might give away, affords an experience of the piece beyond its visual impact. There is a kind of embedding that occurs in Hildebrandt’s work—of music, of course, but also of Hildebrandt’s own history with that music. Though the works have the appearance of blankness—black, white, and silvery tones dominate—they are rich, and multilayered with histories both cultural and personal. This, however, is subtextual and separate from the formal merits of his work, as magnetic tapes weave in and out, to and fro, in an impressive show of arachnid handiwork. The infinite musical variety contained in Hildebrandt’s work doesn’t seem to perturb the relative consistency of its physical form, magnetic ribbons woven in intricate patterns. Sleek surfaces, stark forms, and a restrained color palate make Hildebrandt’s work instantly recognizable for its graphic sensibility. His preference for black recalls Ad Reinhardt’s interest in the seemingly interminable range of that color, as well as Wade Guyton’s shared exploration of reproduction technologies, to name a contemporary of Hildebrandt’s. For this exhibition at Perrotin, Hildebrant has envisioned a total environment. Works take on architectural proportions, acting as a series of screens that organize the space and determine how the viewer moves throughout it. Here, Hildebrandt’s experiments in the visual form of music are amplified, as the viewer is enveloped in a mute musical fabric.